Human LAIR-1, His Tag (CD5-H52H1) is expressed from human 293 cells (HEK293). It contains AA Gln 22 - His 163 (Accession # Q6GTX8-1). The protein has a calculated MW of 17.4 kDa. 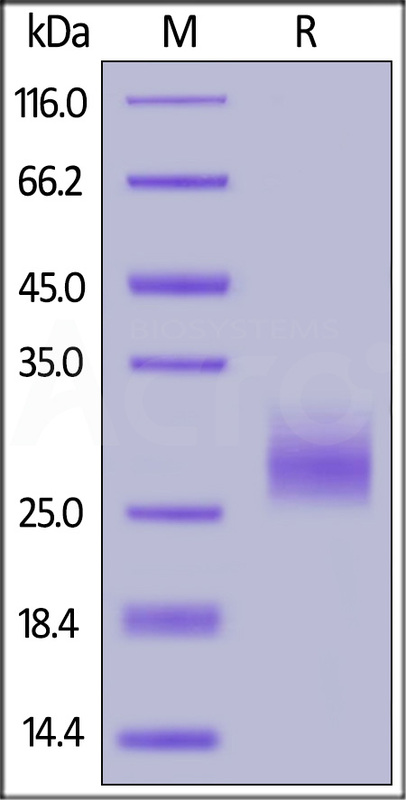 The protein migrates as 30-36 kDa under reducing (R) condition (SDS-PAGE) due to glycosylation. Human LAIR-1, His Tag on SDS-PAGE under reducing (R) condition. The gel was stained overnight with Coomassie Blue. The purity of the protein is greater than 95%. Leukocyte-associated immunoglobulin-like receptor-1 (LAIR-1) is constitutively expressed on the majority of human peripheral blood mononuclear leukocytes. LAIR-1 or CD305 is a transmembrane glycoprotein with a single immunoglobulin-like domain and a cytoplasmic tail containing two immune receptor tyrosine-based inhibitory motifs. LAIR-1 recruits SHP-1 and SHP-2 phosphatases upon activation, and cross-linking of the LAIR-1 antigen on natural killer (NK) cells results in strong inhibition of NK cell–mediated cytotoxicity. Functions as an inhibitory receptor that plays a constitutive negative regulatory role on cytolytic function of natural killer (NK) cells, B-cells and T-cells. Activation by Tyr phosphorylation results in recruitment and activation of the phosphatases PTPN6 and PTPN11. It also reduces the increase of intracellular calcium evoked by B-cell receptor ligation.Diseases associated with LAIR1 include Chronic Active Epstein-Barr Virus Infection and Palindromic Rheumatism. (1) Pioli C, et all., 2000, J Immunol.15;165(10):5530-6. (3) Meyaard L, et all., 1997, Immunity. Aug;7(2):283-90.